Remember the shoot I did many weeks ago for Lacoste watches? The official photos haven’t been released yet but here’s another one of the layouts I did. Like my previous outfit, I had to style this according to the watch I’m wearing. I decided to do a denim on denim look to go with the watch’s young and sporty vibe. Denim on denim can look a little flat and boring but with the right mix, you can avoid that. I opted for an acid wash denim top paired with ombre shorts. The gradient on both my top and shorts make my denim on denim combo interesting. The gradient action didn’t stop there! 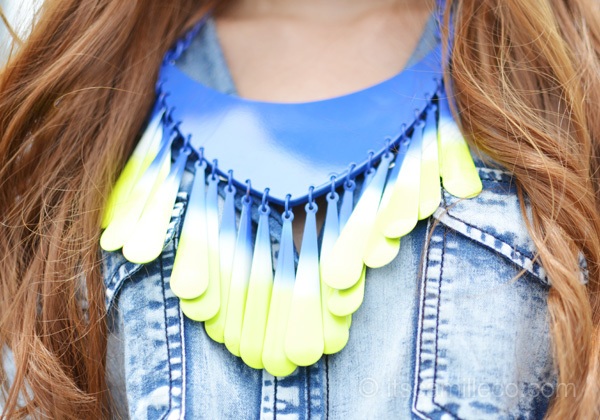 I added a statement necklace that goes from blue to neon green to complete my look. Out of all the layouts we did, I think this is my favorite set. Everything just worked so perfectly, even the location! I love how the blue and neon green colors of my outfit pop against the white beams. Thank God Clariss was able to take these shots while the real photographer was snapping away. Hello Ate Camille! You’re so pretty and glamorous. you are my I D O L ! Remember that! 0^^0 I love the shoes, one of my KPOP fan have those! Stay pretty! I already voted for you Camille!automatic yan! :’) love talaga kita! I’m a fan :) gosh ! wooow! your are so stylish! I wish i had all your outfits in my closet! Where did you get your ah-mazing shoes!!! I died when I saw them! Where did you bought your shoe? Forgot to put the brand and link! :) I just posted them :) Sorry! This is an amazing outfit! And omg, your shoes are gorgeous! cutie camille! you look awesome! I’ve always wanted to try denim on denim. But it seems…flat, for me. Any suggestions or advice for it? That’s the spirit! Thank you! Thanks Pk! Vishoes! Kakalagay ko lang ng credits :) Forgot to put it earlier! WHAT NO COMMENTS YET! are you kidding or is my internet just slow! Attention people! This is a public service announcement: THIS GIRL IS KILLING WITH THIS OUTFIT AND ITS WAS ALL INSPIRED BY A FREAKIN WATCH! I love your style thats probably why I just went crazy right there! The dip dyed shorts, the classic blue jean blouse, the blue ombre yellow abstract necklace, the bracelets, the neon yellow heels! Like im dead with joi! Thank You! Haha thanks Nicole! I jut haven’t approved the comments yet because I’m currently abroad. Don’t you worry! The comments are coming haha! :) Thanks again! Beautiful outfit. I love gradients! Ofcourse you get my support, and why should you not win? I think you are as great aswell :-D.
Denim will also be denim. Casual and never not stylish. Oh my god, the neon colors really catch my eyes! I love everything Ate Camille! I can’t stop looking at your whole outfit! The shoes!!! It looks soooo comfy =)) I love it!!! Love d outfit! :)) hey ate camille cn i ask wat goes best wth denim red shorts? Ds s d first tym i tried shorts dt screams color n attention alrdy! :) pls help! :)) tnx! Tnx so much camille! :)) dt really helpd a alot! U inspire me everyday! Of course i will vote you. You are my favorite blogger. And taking time to reply in our comments is a plus too! :) i hope you’ll win. Good luck! You already have my vote for the Tatt Awards! As always, the shoes are AWESOME!!! Love it! Can you even walk properly with those heels? Hello Ms. Camille! I really like your hair color. Do you happen to know what exactly that color is? wooowww..peg na peg ko look nyo.supaahhh!!! !especially the denim top!!! I love love love this look :) it’s so funnnnnn! Everything is so refreshing to my eyes. Your legs just go on and on and on! I envy you! love your style! =) how much for that watch? 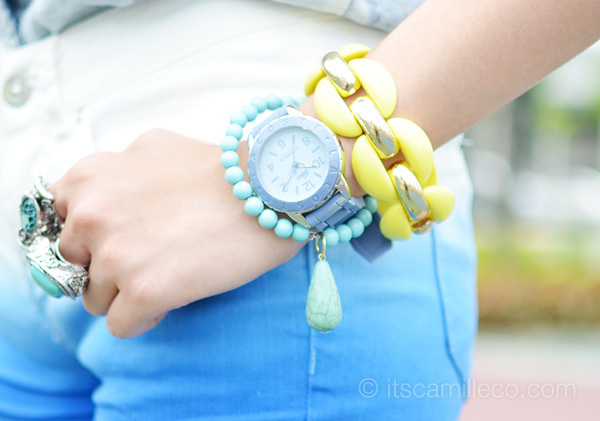 GREAT mix of denim and wonderful pop of yellow…. WOW! I love these photos!! The outfit is adorable and those shoes are the perfect touch! Amazing!! hai camille, i just read ur web today (i knew from brownplattform) and its so cool. I really like all of ur picture cos it’s outdoor; so bright and colorful but especially i love ur style, so chic and sweet. I wanna ask does ur hair color keep changing, cos i saw in latest post it has diferent colour. n btw where is ur store and can it delivered to jakarta, cos i saw d price not in dollar. how do you maintain your hair color and the curls? it always look good on you… i cant wear too high shoes for now because im pregnant hahaha but soon.. .i will have on of these awesome shoes!!!!!!!!!! love it! you know you got my vote, right? KUDOS! all the best, manalo matalo stand out ka pa rin s knilang lahat. Thanks Precious! :) Manalo, matalo, I appreciate it! VOTED! WOOOH Go MY FAVE CAMILLE! full support ms. Camille…were always at your back…. Haha awww thank you :) The other finalists are all so good!